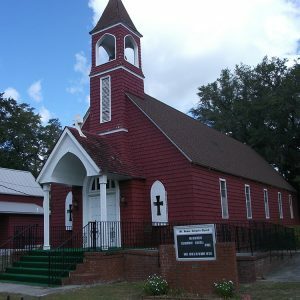 St. James the Greater Catholic Mission is an extremely rare example of a rural, southern, black Roman Catholic parish in continuous existence from its antebellum origins to today. The site includes a sanctuary, a school, and a cemetery. The sanctuary, built around 1935 in the late Gothic Revival style and entirely clad in wooden shingles, is on the same site as two previous churches built in 1833 and 1894. The schoolhouse, constructed in 1901, is rare example of a turn-of-the-twentieth-century I-house built specifically as a school for African Americans. It provided private education for local students, regardless of religious affiliation, until 1960.